Geotech Unmanned Aircraft Systems innovates, manufactures and distributes patented, unmanned technology which can be piloted remotely using advanced ground station products. Geotech's unmanned aerial systems (UASs) are certified for airworthiness, manufactured in the USA, and include pilot training. Geotech's lean manufacturing facility is ISO Certified and meets OSHA safety requirements. Leptron technologies are now available for commercial, public and private applications. On-site maintenance and repair ensure your equipment is operating at peak performance and ready for your next assignment. With decades of aerospace experience, Geotech leads the industry in sensing technologies that are cutting-edge and adept at efficient solutions. Students from all backgrounds and experience levels will gain valuable industry knowledge and hands-on experience learning how to fly professional-grade unmanned aircraft systems (UAS) both manually and autonomously. Geotech instructors incorporate real-world experience to help students conduct search and rescue missions, inspections, data collection and processing. Per Title 14 CFR Parts 61, 91, and 107 "A person operating a small UAS must hold a remote pilot airmen certificate with a small UAS rating." Geotech pilot instructors offer the experience, knowledge, and authority to prepare students for the Aeronautical Knowledge Exam. The ground school module in combination with flight training gives students a thorough perspective of airspace and how to share it responsibly. Since 2009, Geotech has been utilizing sUAS (small-unmanned aircraft system) technology to collect videography, photography, and remote sensor data as a professional service. The services we offer provide an aerial perspective tailored to your needs. Collectively, our team offers decades of manned and unmanned aviation experience. Since 2009, Geotech utilizes unmanned aircraft technology to collect drone photography, video, and remote data for aerial mapping as a professional service. Our team of remote pilots are authorized by the FAA to operate UAS commercially nationwide. These services provide an aerial perspective tailored to your unique business or project needs. 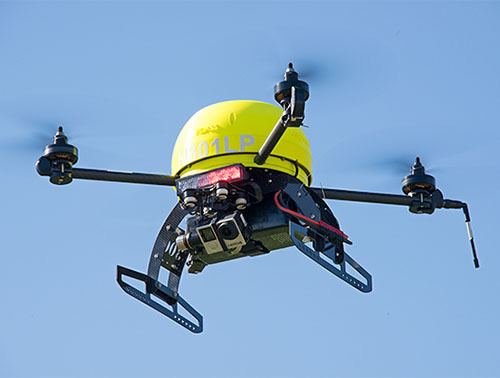 Rapidly Deployable Aerial Surveillance System (RDASS) Quadcopters are innovative high-performance systems for high or low altitude surveillance, photography and sensor deployment.